So it does beg the question. Where is it documented that Ford programs for a re-gen at 500 miles. I know people are not believing it but I did not see any regens during that 1300 miles of pulling the trailer. No reduction in fuel economy, no reduction of filter % in filter display. None. As I stated earlier I very well could have missed seeing a regen but not two. The filter full display stayed on about 90% of the drive and never moved. It it possible parameters changed in the firmware to a maximum mileage after the 2011 MY? Page 31 of the 2015 Diesel Supplemental Manual states this which implies 500 miles as the upper limit. The regeneration process operates more efficiently when you safely operate your vehicle at least 30 mph (48 km/h) with a steady pedal for approximately 20 minutes to complete the process. The frequency and duration of regeneration will fluctuate by how you drive your vehicle, outside air temperature, and altitude. For most driving, regeneration frequency will vary from 100 - 500 miles (161 - 805 km) between occurrences and each occurrence will last from 9 - 20 minutes. You can usually reduce the duration of regeneration if you maintain a constant speed above 30 mph (48 km/h). I have found it in one of the 3 Ford Workshop DVD's I have (2014, 2015 and 2016) where it stated 500 miles since the last completed regeneration. I will try to search for it this weekend. I ewil check out the supplement guide tommorow for a few different model years and see if there is any difference also wondering any of you guys have a wide frame cab and chassis F450/550 6.7 ?? Reason I ask is I have seen some of those models come with only one NOX sensor and some come with two NOX sensors and out of the two ways that they were set up the models with only one NOX sensor come in to the dealership way less frequent for reductant performance issues. Anyone else in the field noticed this as well ??? Is this data a CFR would log long term? I'm not sure that Ford would put something in a manual you're not supposed to have to care about. It's supposed to happen automatically and be "worry free". Why would you tell people about something that happens automatically and for the average / most drivers they can't do anything about? They do mention in the manual the "drive to clean" message as well as the "cleaning exhaust filter" message. Suggest you use Google, I realize the interweb can be misleading, you have to look at where the content comes from. That being said, GM uses a sensor to trigger their regens. They have a sensor before and after the DPF. If the pressure drops a regen is triggered. Ford for whatever reason decided to do one every 500 miles. I've had 2 concurrent regens happen on 3 occasions that I know of, did one with ~480 miles and then another at 500. I did the search and find nothing but statements from folks like you that a automatic regen happens every 500 miles automatically. Since I did not see a regen in my 1300 mile trek either I have a issue with my truck or a 500 mile automatic regen isn't programmed into the pcm. I am not questioning your word on the matter but I am asking where Ford makes that statement. If I am having a regen issue (or lack of) with my truck I will take it into the dealer and have them look at it. So, I can confidently say that I heard on the internet that Ford does a regen at 500 mile intervals whether it needs it or not? Just making sure I know what I am talking about when I take it in. There's another user on here, senix, who said his truck does the same thing that you are describing, which is he will go out beyond 500 miles and not have a regen as he is towing a load. That sounds like his truck, as yours, as long as as you are towing and keeping EGTs high enough for passive regens, it keeps the filter clean and somehow these trucks, yours and his, do not force a regen. I've seen him comment this more than once. As for this statement from page 31 of the Diesel Supplement that Larry posted up, " For most driving, regeneration frequency will vary from 100 - 500 miles" what caught my attention was the word "most." It doesn't say "ALL." Maybe that means something. I don't know. Maybe you did miss a regen, but you know your truck better than anyone here. There are folks here that who know more than me. But maybe you and senix have trucks that do this. How does your truck do when unloaded? These trucks for the most part take care of themselves.. The DEF cleans itself and does it automatically. It flashes on the screen for a couple seconds and you may not even see it. I wonder why people are so worried about this. If you think Dodge and Chevy are different they are not. The truck will give you a 500 mile till it goes into limp mode. There are many dealers within any 500 miles in the USA. Maybe people who buy these newer trucks made a mistake and should have bought a older truck so they don't have to worry so much. People here that recommend removing these systems from there trucks are saying Ford built a piece of crap. None of this stuff works. It's trash. How can they call themselves Ford enthusiast when all I hear is complaints about there truck. I have 5 Fords and wouldn't buy anything else. I have no complainants about any of them. There are other references in the service manual that state if the Distance Since Last Completed Regeneration/Normal Distance Traveled Between Completed Regeneration events is not between 60 and 500 miles, there could be internal damage to the particulate filter. The above post makes my point. It does not say that a regen is automatic at 500 miles. and that would be correct if the filter is full and no regen takes place. I just don't see a regen initiated if one is not necessary. As I posted I was watching the $full periodically and did not notice any increase. Then I set the display for the rest of the trip except for a couple of times I moved it to oil temp and truck mode (angles) but that was just for seconds and back to the dpf% display. It did not increase in % nor did it decrease in %. That tells me that no regen took place. Now, I can't say that at every 500 miles the pcm went out and looked at the filter and didn't do a regen due to it not being needed but as everyone and documentation indicates it is constantly monitoring DPF% anyway. Edit to add: I have put about 150 miles on the truck since the completion of the trip and now the %DPF is at 45%. So, it looks like everything is working properly. I will know when it reaches 100% and does the next regen. I interpret the above a bit differently. If the DPF goes longer than 500 miles between regens then it is not operating as designed. The PCM monitors soot load as well as miles driven since the last completed regen. Others have reported while monitoring with a scan tool the truck will enter a regen every 500 miles. I'm not stating you have an issue with your DPF but rather it's more likely you missed the cleaning exhaust filter notification(s). I monitored the % display for over 1000 miles. I did not miss seeing a regen. If I had missed the message that appears when it starts I certainly would have noticed the DPF% going down. It didn't happen. The DPF% didn't go up or down. So unless it does a stealth regen it didn't happen. 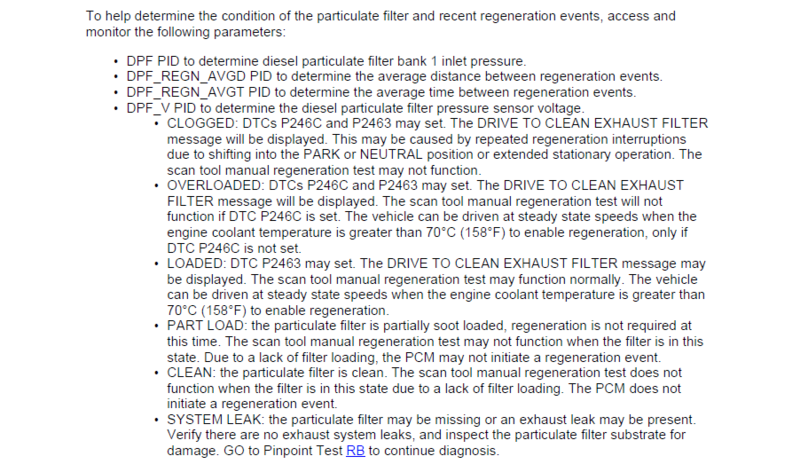 While I believe what is stated by Ford above I'm sure they are assuming that a DPF filter is full at 500 miles. I'm sure if they would have said that a regen during extreme or heavy duty use would be getting a lot of complaints that regens are happening too soon. FWIW, when I am using the truck locally for in town and highway driving it will do a regen in less than 400 miles or once a tank of fuel. While that 1800 mile trip is the exception I have noticed that regens are extended during towing. I just didn't think it would have gone that far.